We're not exactly estate sale people. Or we weren't, until yesterday, when we decided to pop into an estate sale our friend Jessie had told us about. The house was out in Urban Sprawl, Florida, nestled among the rows upon rows of unsold and foreclosed-upon houses. I was a little worried driving up, but this place was unbelievable. Like someone had robbed a Williams-Sonoma and decided to share. Inside we found the most incredible kitchen, outfitted with our dream double oven, stainless dishwasher, and huge center island stocked with top-of-the-line cookware. All Clad roasting pans, sauce pots, double boilers, and frying pans were displayed next to sets of Shun Knives and Emile Henry dutch ovens. I was in heaven, except that in heaven I doubt we'll have to pay for such cookware with plastic. Amazingly, I left the sale with no All-Clad cookware or Shun knives. Of course I kicked myself all the way home for that, but at least I snagged a nonstick popover pan, which I used to make my first batch of "real" popovers this afternoon. (We also picked up a set of crystal double old fashioned glasses, a collectible Lord of The Rings box set, and some super secret Christmas presents). 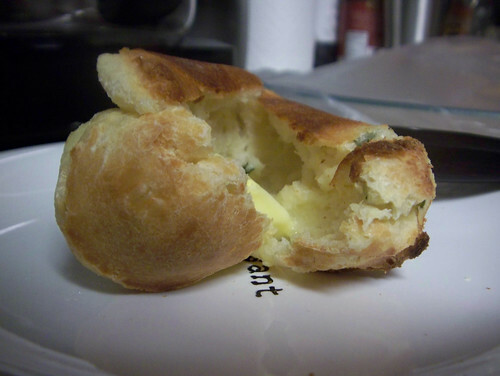 I don't know much about the science behind popover pans — and I'm sure many would scoff at the existence of such a unitasker in my kitchen — but these things rose phenomenally high, with the dough seeming to inflate like a balloon until the tops formed into the shape of tiny chef's hats. They browned perfectly and were nearly hollow inside. Just like you'd expect from a fancy restaurant except that they came out of my humble oven. If you don't have a popover pan, this recipe will still work — you'll just end up with a more muffin-like shape with a little less air. 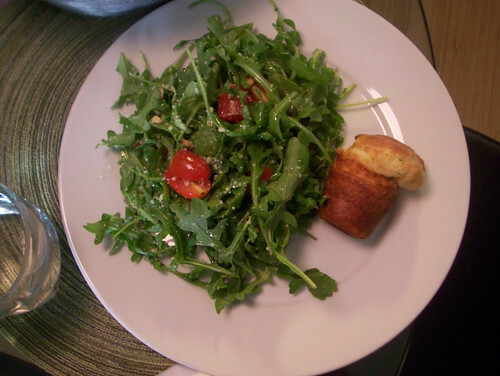 This recipe is inspired by the herbed popovers recipe from Gale Gand's Brunch! : 100 Fantastic Recipes for the Weekend's Best Meal. We're fortunate to have fantastic local eggs and a garden with tarragon growing like weeds; if nothing else, though, use organic eggs, milk and butter. It's better for the planet and better for your body. Enjoy!